Sandmeyer Steel Company displays its extraordinary steel processing capabilities, facilities, and extensive inventories with sweeping overhead full-motion views with aerial drone videos by DDA. Visit the Sandmeyer Steel website and scroll down to view the two aerial drone videos. Sandmeyer Steel, a global leader of stainless steel and nickel alloy plate production, was working with Dynamic Digital Advertising in the redesign and redevelopment of their corporate website. To enhance their potential and existing customers’ viewing experience, they thought that featuring a corporate capabilities video would be best. Dynamic Digital Advertising has filmed and produced videos for Sandmeyer in the past, so they were familiar with DDA’s extensive video capabilities. Sandmeyer wanted a video that introduces their services, facilities and extensive inventory in a way that is both unique and captivating. Dynamic Digital Advertising, always known for pushing the boundaries of innovation, proposed using their aerial drone to capture footage of Sandmeyer’s facility. Its wide open spaces, high ceilings and action-filled warehouse served as a perfect location for this type of video technology. Before the shoot, DDA and Sandmeyer reviewed the details to ensure that everything was captured efficiently and portrayed professionally. It was important to capture as many plate processing machines and operations as possible, the day of the shoot. DDA went on-site to Sandmeyer Steel to capture footage using an aerial drone. The drone was flown both indoors, where plate processing takes place, and outdoors, where their inventory is stored. The aerial drone footage does a good job of highlighting the 16 million pounds of stock Sandmeyer has on-hand as well as their spacious and well-equipped production facilities. 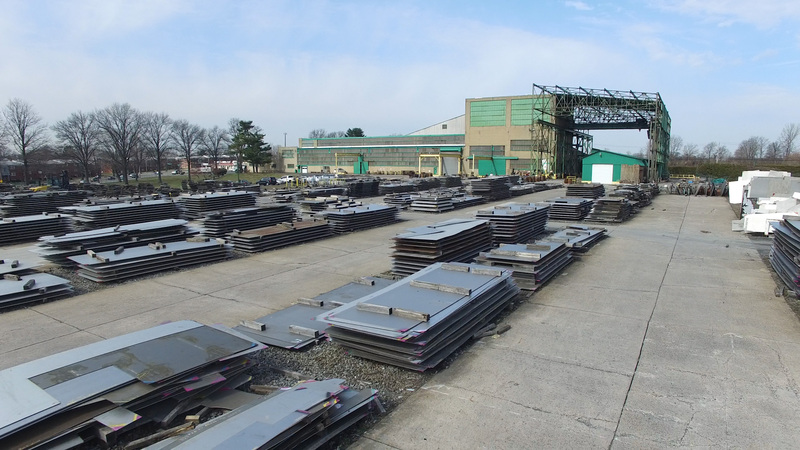 This gives the viewer a different perspective than with traditional video equipment, as they are able to clearly see over tall stacks of stainless steel plates and with direct view of large equipment, which are walled in for safety purposes. Post-production involved the incorporation of the drone footage to create a presentation that’s visually appealing and tells the story of Sandmeyer and its many capabilities and processes. A variety of speeds throughout each of the two aerial drone videos gives not only the visual of flying, but also the ability to see as many of Sandmeyer’s capabilities in a short period of time. The aerial drone videos are featured throughout Sandmeyer’s redesigned website, showing visitors how vast their inventory and services are.